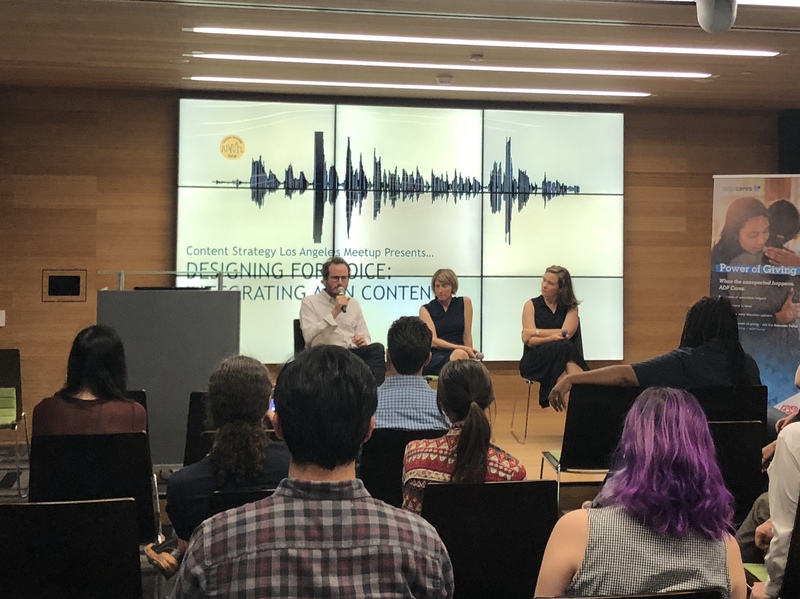 Content Strategy Los Angeles’ August event, Designing for Voice: Integrating AI in Content, brought together professionals working in AI as well as an eclectic group of entrepreneurs, marketers, producers and designers interested in voice and other emerging technologies. 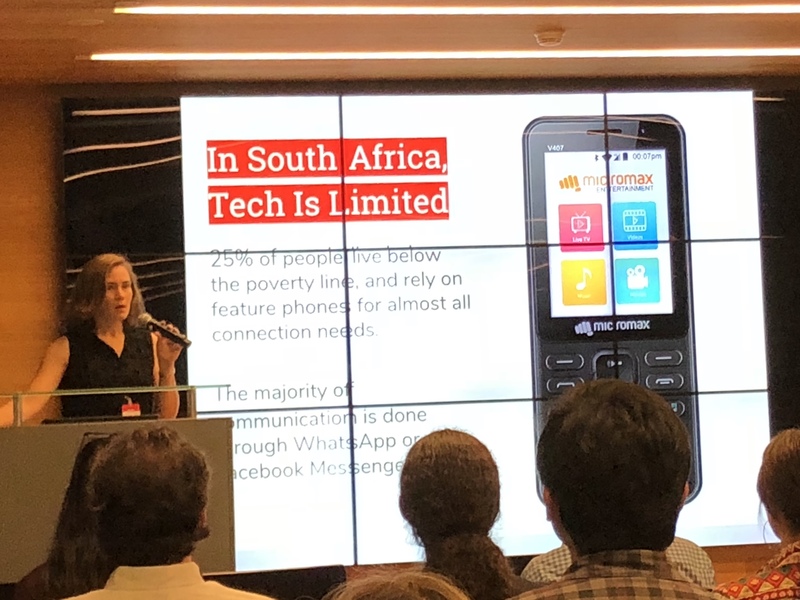 This event hosted at ADP’s Innovation Studio 55 in Pasadena, featured a trio of speakers presenting talks on the utilization of bot technology for a global initiative designed for social good, the unique design challenges of voice technology and the impact of AI on privacy concerns. The first speaker was Alison Fox, a strategist with 15 years experience spanning content, marketing and branding. She spoke about her current project with Global Citizen building bot technology to enable activism in Africa. “CitizenBot”, an egalitarian bot working on Facebook Messenger Lite that answers in one or two-word commands, was designed to serve as a digital channel for Global Citizen to allow members to take social action by leveraging admissions to their upcoming Mandela 100 Global Citizen Festival. The ultra-simple design of CitizenBot allows it to be inclusive of citizens with access to limited technology. 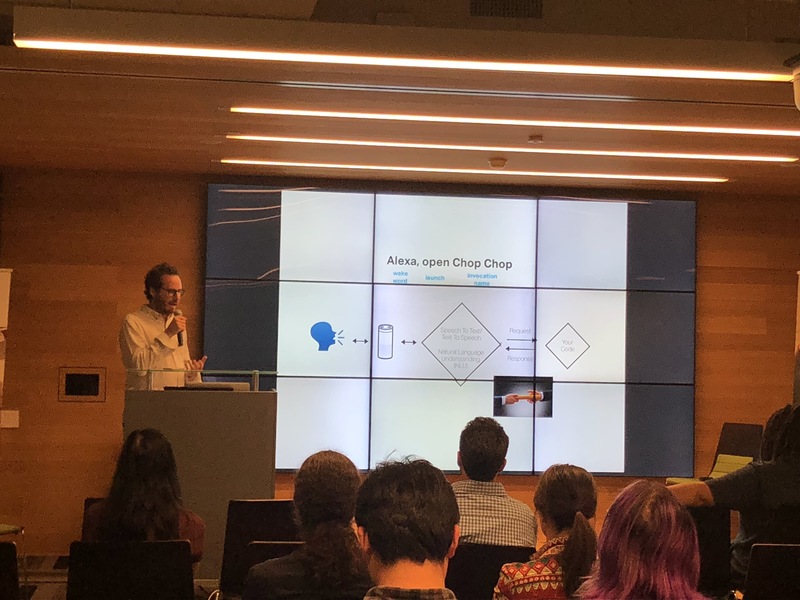 Next, John Gillian, a creative producer, voice designer and Alexa developer, started his talk by playing a video of one of his creations––Chop Chop, a hands-free kitchen companion serving up easy-to-follow video tutorials on chopping fresh produce. Through this example, he discussed the binary nature of voice user interface and the challenge of surfacing content where there isn’t a hierarchy of organization from which to pull information. He addressed the implications of the constraint on conversational metadata and asset management and ended with an inquiry into the great unknown and opportunity of conversational discovery of voice technology. Lastly, Christine Meinders of Feminist.AI, a community AI research and design group focused on co-designing intelligent products, experiences and futures from a feminist (inclusive) approach, discussed opportunities in voice and gesture technology and what that means for privacy and other social implications. She brought to light hard questions such as “Is utilizing emotion analysis without user consent a violation of privacy?” Also, while gender norms have dictated female voices in most AI technologies, what are the implications connecting the behavior of giving voice command to a female-only voice? As with any new area of technology, voice design presents distinct challenges as well as exciting opportunities for problem solving and innovation. 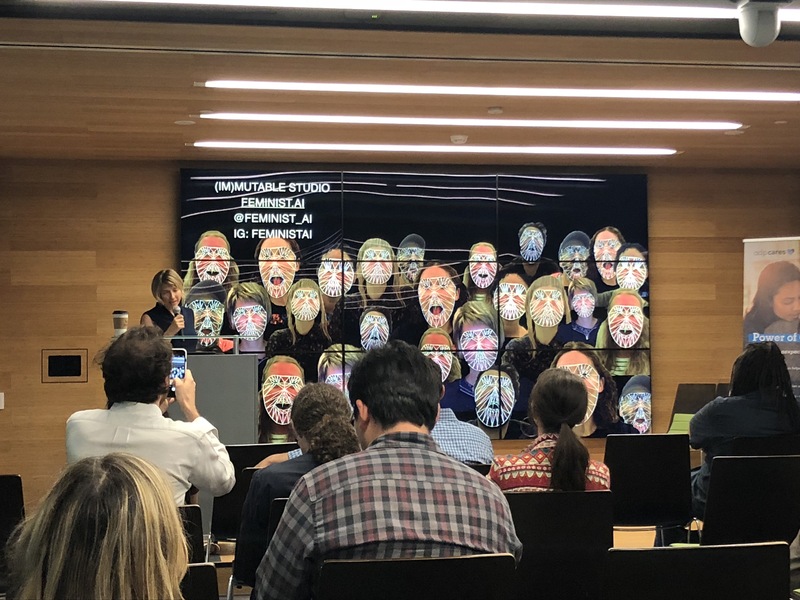 Each of the speakers brought an enthusiasm and sense of meaning to the work they were doing through voice integration, not only by providing users solutions, but also by designing to impact positive social change. I wish I could have seen that presentation: it looks fantastic. Unfortunately, I live in Phoenix.